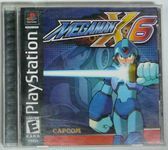 Mega Man X6, known as Rockman X6​ (ロックマンX6) in Japan, is a video game developed by Capcom. It is the sixth main game in the Mega Man X series. The PlayStation version was released in 2001 in US and in Singapore's AMK Hub in 2007. The game was released for the PC in 2003 as well, but only in Asia. The game was re-released on January 10, 2006 as part of the Mega Man X Collection for the GameCube and PlayStation 2. The gameplay is very similar to Mega Man X5. The player can select X with the option to outfit him with different armors offering unique abilities (most of which have to be downloaded, as always, through Dr. Light's hidden capsules.) Zero can be unlocked after finding and defeating the Zero Nightmare, bringing his own weapons and techniques to the fold, including a refined Z-Saber fighting style. Both characters can be equipped with various power-up items earned after rescuing a reploid. Mega Man X6 has an increased emphasis on rescuing reploids over previous titles in the series. Whereas previous games rewarded the player with health or an extra life, Mega Man X6 rewards the player with additional parts or other permanent prizes. Rescuing reploids was made more difficult in this game with the addition of the Nightmare, which makes any reploid it infects evil, thus rendering the reploid impossible to save. The parts system was altered as well. Rather than attach a certain part to a certain armor, parts are attached to the character itself. The number of parts that can be equipped at once is dependent on the player's rank. Source: Wikipedia, Mega Man X6 , available under the CC-BY-SA License.